During a trip to the Kgalagadi Transfrontier Park in South Africa over September of 2009, we came across an amorous lion couple by the side of the road in front of a fallen camelthorn tree. Those of you who have been fortunate enough to witness their courtship up close and personal would know that it's an unforgettable experience. The noises they make while doing their thing are spine-chilling and they tend to keep at it for a few consecutive days, allowing many safari-goers to enjoy the sighting. 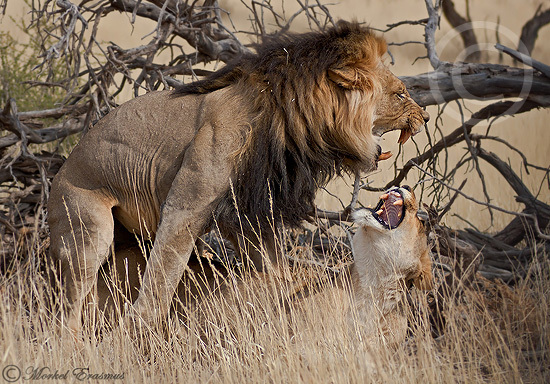 Many photographers have taken photos of lions mating in places like the Serengeti, allowing for smooth, clean backgrounds. What I like about this presentation, is the ferocity of the absolute pinnacle of their act of procreation, depicted against a backdrop of an iconic Kalahari background of a fallen camelthorn acacia. Enjoy the coming weekend, and don't leave your cameras in their bags!